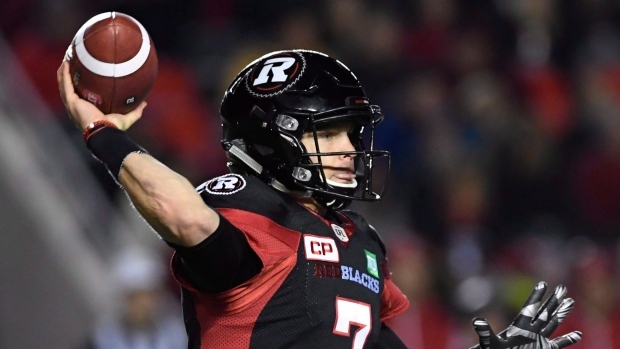 OTTAWA — The Ottawa Redblacks have re-signed quarterback Trevor Harris for the 2018 CFL season. Harris finished tied for the CFL lead in touchdown passes with 30 and fourth in passing yards with 4,679 in the 2017 season, his first as the Redblacks' full-time starting quarterback. "Trevor was one of the top quarterbacks in the CFL last year and bringing him back was one of our top priorities this off-season," Redblacks general manager Marcel Desjardins said in a statement. "We're very pleased that Trevor will remain a Redblack moving forward." Harris recorded 3,301 passing yards and 16 touchdowns in his first season with Ottawa in 2016 while sharing quarterback duties with Henry Burris. Prior to joining Ottawa, he spent four seasons in Toronto, starting 17 games with 33 touchdowns and 4,354 passing yards in 2015 in place of usual starter Ricky Ray, who missed half the year recovering from off-season shoulder surgery before returning as Harris's backup.